The story couldn’t have been scripted any better. 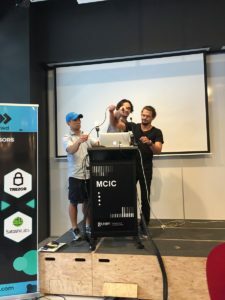 3 strangers with very different skill sets coming together at the last minute and snapping 2nd place in the 2017 Australian Blockchain Hackathon at the Michael Crouch Innovation Centre at the University of New South Wales in the weekend of November 24. The build up really happened the week before when legendary Bokky ran these workshops which looking back was really a pre-hackathon hackathon. Newbies got up and shared potential ideas for a hackathon. I didn’t have any ideas to productise to speak off but shared my ongoing research www.theicotrain.com and also an project I worked on earlier in the year Uber’ing Electricity on the Blockchain. 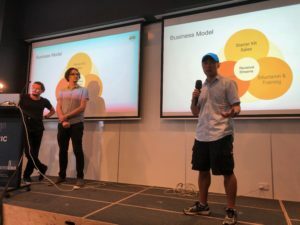 There was talk of taking the Uber’ing Electricity concept and upgrading it to work with the micro Raiden network but all my gear was back in NZ so I ended up helping the organising team sweep the floor, wipe tables and carry pizza boxes from the boot of a car to the table. Matt did a great job getting Mark up to speed with what blockchains are and how we could spin up a node, make transactions and listen to an events. It was a mad rush getting the pitch deck submitted by 3pm but we made it just in time. While Matt and I practised the pitch Mark and Adrian continued to work on the code. Getting a handful of lines of code to work was harder than we thought but it finally worked. 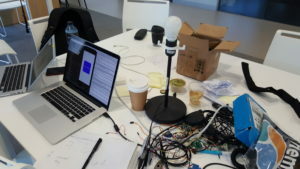 There was added drama when we moved JOE (arduino, lamp, wires, extension code) down stairs because when we tested it again it all stopped working. Luckily we were pitch #11 and finally got it working 10 minutes before our turn. Whew! There was a bit of set up required when we got called up. 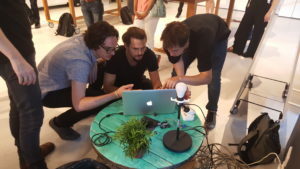 It was a real team effort making sure all the wires stayed connected! The pitch went ok apart from the fact that we spelt education wrong in the pitch deck! How ironic considering one of our goals was to help educate the next generation on this technology! None of us took any notice of the prize pool because we truly never thought we’d even be in contention. We really did hack everything together and we all contributed from our different areas and backgrounds. 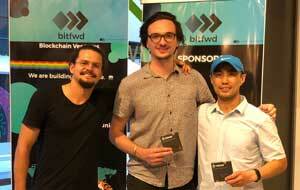 We are grateful that the judges saw our vision of helping everyone learn this new technology platform in a hands on way with hardware and open source software wrapped in an education package for schools, universities and even organisations wanting to get practical experience with blockchain technologies. All the pitches were great and as mentioned by one of the judges, on another given day, it could have been someone else. All in all it was an amazing event, put together by an amazing team, I met some really smart people and made some really cool friends!